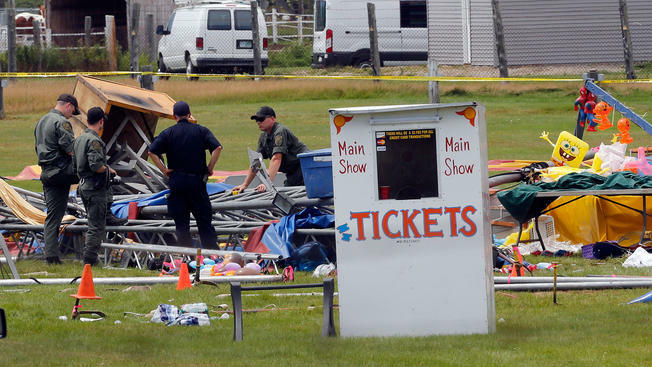 A Florida-based circus operator has agreed to pay $24,000 in fines issued by federal safety officials for a tent collapse that killed two people and injured dozens in New Hampshire last year. Forty-one-year-old Robert Young and his 6-year-old daughter, Annabelle, of Vermont, died Aug. 3, 2015, when a storm with 75 mph winds blew through the Lancaster Fairgrounds, toppling the tent just minutes after about 100 people had settled in for a show. Fifty others were injured. Sarasota-based Walker International Events contested $33,000 in fines from the Occupational Safety and Health Administration; a judge recently approved a settlement. OSHA said Walker failed to properly erect the tent and ignored severe weather and high-wind warnings. Walker is out of business, and OSHA said Wednesday it won't resume operations unless it first implements a comprehensive safety and health management plan.